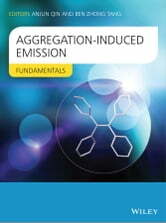 Aggregation-Induced Emission (AIE) is a novel photophysical phenomenon which offers a new platform for researchers to look into the light-emitting processes from luminogen aggregates, from which useful information on structure–property relationships may be collected and mechanistic insights may be gained. The discovery of the AIE effect opens a new avenue for the development of new luminogen materials in the aggregate or solid state. By enabling light emission in the practically useful solid state, AIE has the potential to expand significantly the technological applications of luminescent materials. Aggregation-Induced Emission: Fundamentals is the first book to explore the fundamental issues of AIE, including the design, synthesis, and photophysical behavior of AIE-active molecules and polymers. The control of the morphological structures of the aggregates of AIE-active materials, and the experimental investigation and theoretical understanding of the AIE mechanism, are also covered in this volume. This book is essential reading for scientists and engineers who are designing optoelectronic materials and biomedical sensors, and will also be of interest to academic researchers in materials science and physical and synthetic organic chemistry, as well as physicists and biological chemists.